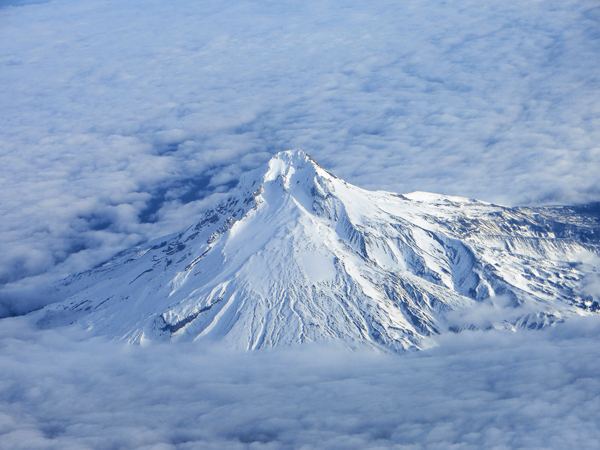 It was time to fly again and this week I had the chance to visit a state I'd never been to before. 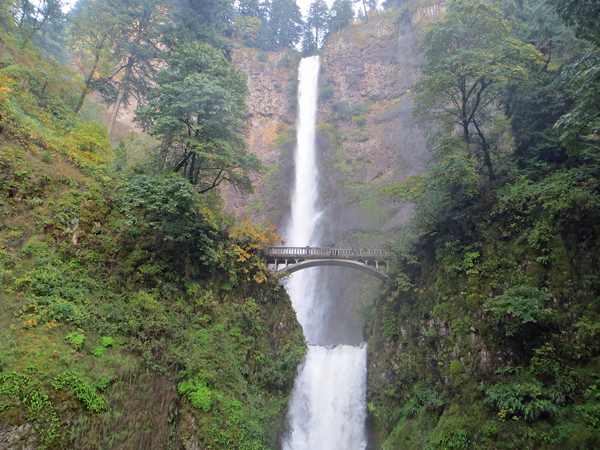 I went to Oregon. Home of the Mighty Ducks and some mighty mountains. It's also a state where it is illegal to pump your own gas. They literally have an attendant at every gas station waiting to pump your gas for you. Which is nice. Pumping gas is really hard. 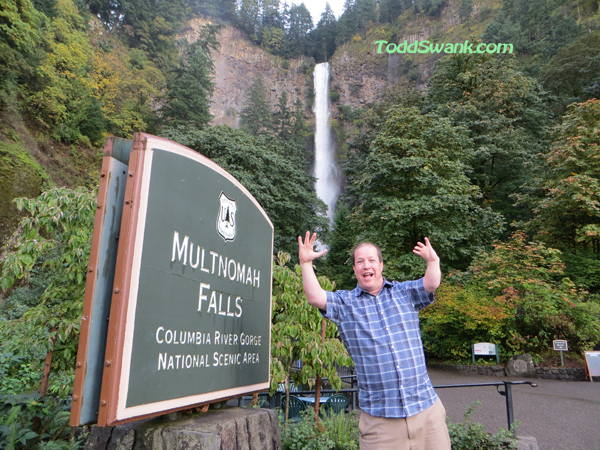 When we left the airport, my co-worker suggested we go a little bit out of our way before going to the hotel and see Multnomah Falls. I'm so glad we did! This waterfall was incredible! One of the tallest I'd ever seen! And best of all, it was full of water!! The thing never stopped pouring water over it the entire time we were standing there. I have no clue who's paying for it, butI'm guessing it has to be very expensive to run that much water for so long. Then I saw this sign which made me realize the government was in charge of it and then it started making sense. No wonder they keep running out of money if they're just going to keep wasting all that water! This is my co-worker, Tim Poor. He's our Director of Field Sales and is way more technical than I am. He's also an expert on Portland having traveled here several times before. It was his idea to visit the Falls and I'm so glad we did. 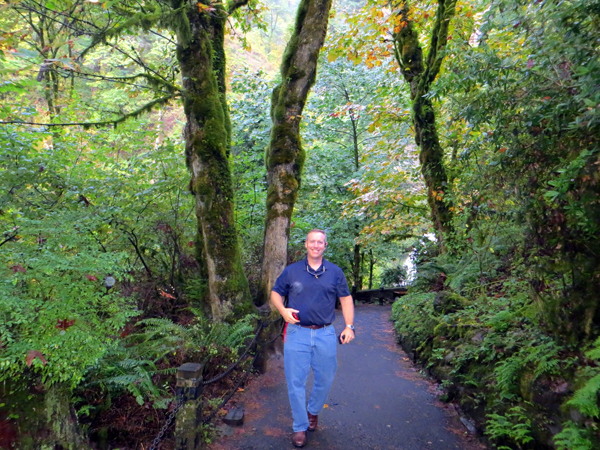 It was amazing to see such beautiful vegetation in the paths that led up to the majestic falls. I would have loved the chance to spend more time here, because it really is spectacular. 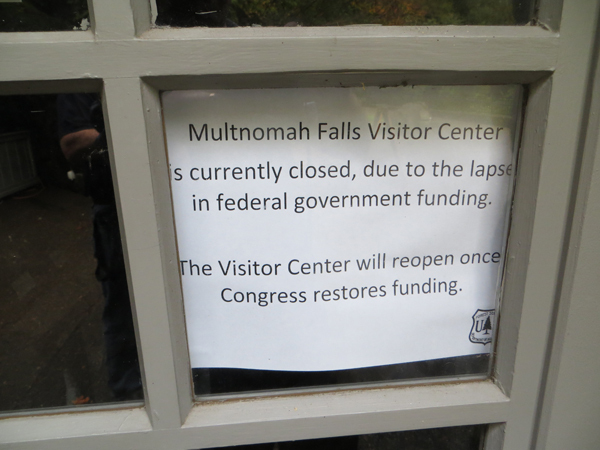 But we weren't in Portland for sight-seeing. We were here for the Intel EPSD Leadership Conference 2013. It's a chance for Intel to meet with some of their large customers and showcase what technology is coming out in the next couple of years so they can get feedback on their plans at an early stage. We met with people throughout their server hardware division and learned all sorts of cool stuff. Unfortunately, none of which I can share here else the black limosines will pull up outside of my house and take me away forever. Although we weren't offered a tour of their new Fab, we did stop by early one night to sneak a peek. According to this article, Intel is expcted to spend at least $3 Billion dollars building additional capacity which will give them an additional 2.5 million square feet of space to build chips. There were more cranes than I've ever seen in one place at a time and the place was humming with activity. 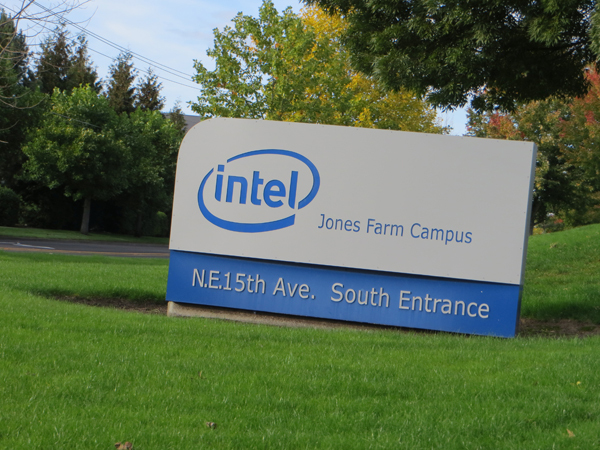 It was pretty cool to witness how a world class manufacturer like Intel creates their factories. The two days we were there were filled with meetings from 7am to 10PM. 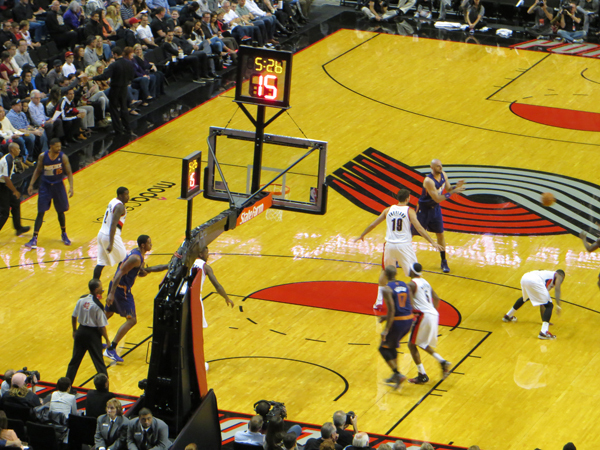 On Wednesday night, we attended the Portland Trailblazers/Phoenix Suns pre-season basketball game. 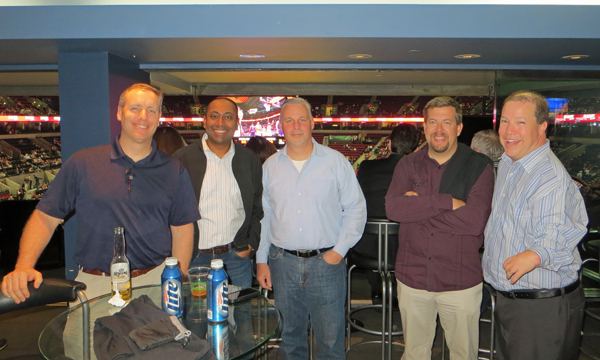 Intel had a great suite for a big group of us to enjoy the game. This was my first time going to a pre-season basketball game between two teams I don't follow, but it was exhilerating. At least for the few minutes I watched it. Most of the time I was in the suite networking with other computer people. 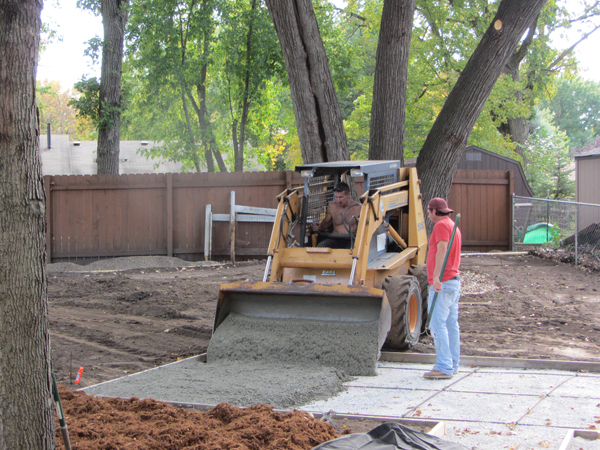 While I was out of town, our backyard project went through its next phase. 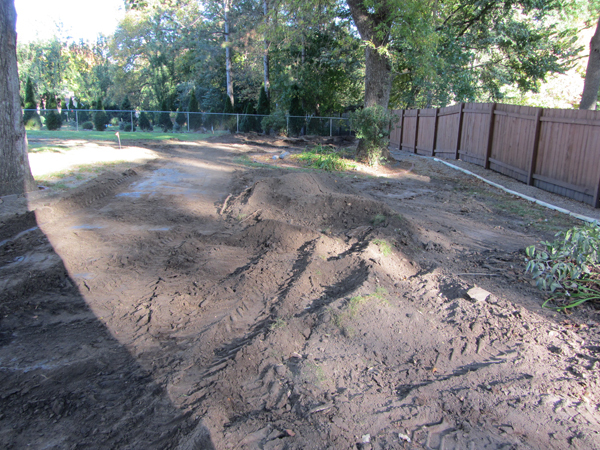 The landscaper brought in a whole bunch of mud and started regrading the whole thing. I wasn't here, but I'm hoping seeing this made Miss Sheri feel kind of dirty. The cement slab was laid for the centerpiece of the project which will be delivered soon. I asked the boys why they didn't put handprints in the cement when I came home, but they said that by the time they came home from school it was already hard. So it's handless. Just like most of our family. 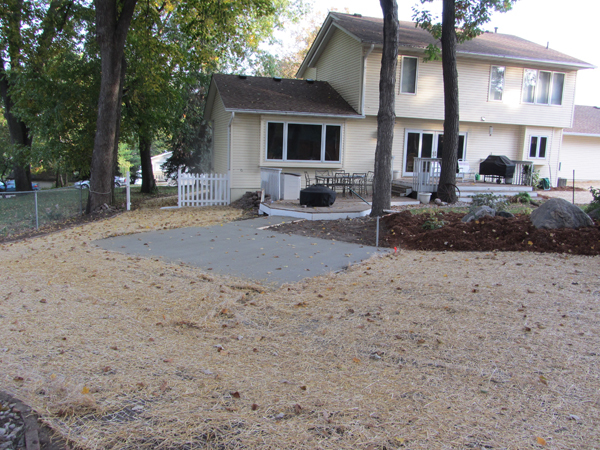 By the time I came home, the landscaper was done and the cement had been laid. I'm pretty happy with it, although I really wasn't expecting for our yard to now be yellow. It's going to take some getting used to. It must be a new style of doing lawns which I just haven't seen before. At least it will match the house nicely. On Saturday, the boys helped with a Food Drive in conjunction with the Boy Scouts, Girl Scouts, and Lions Club. We usually do pretty good at these, but this was a banner year for sure! They basically filled an entire truck full of food donations. People are so nice and generous. 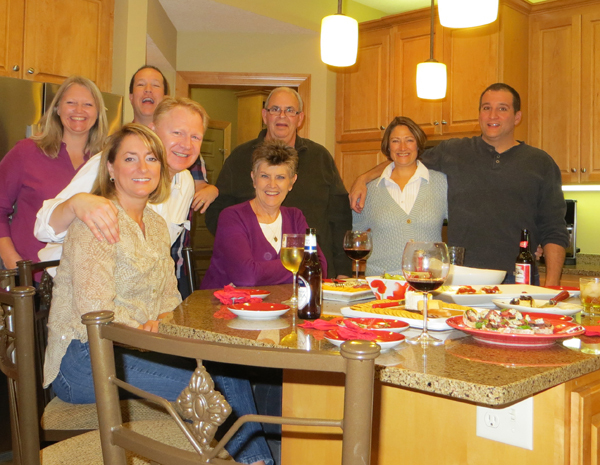 On Saturday night, we connected with some good friends for some snacks and really good conversations. I miss these guys a lot, but it's nice that we can still get together from time to time to catch up on the Good Ole Days.